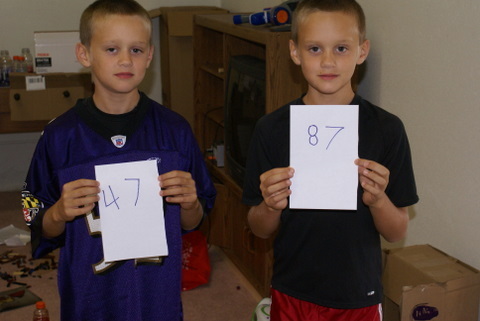 Well, there is nothing more random than a pair of 9 year old twin boys, so I asked Will and Joe to each pick a number between 1 and 88 (88!! that’s a lot of comments, people! thanks for inviting all of your friends!!). The numbers they picked correspond to comments from Betsy and Michele in TN. Congratulations to the both of you, I’ll be in touch privately with the details of your prezzies. Thanks a bunch to all of you that played along. I had fun reading your comments, and will try to respond to those that I haven’t responded to yet in the next day or so. Plus, I have to go add all of those blogs to my blog reader!! August 18, 2008 — You are welcome to join in the party by telling me what you are bringing, but the prize drawing is now closed. Thanks to so many for participating!!! I stayed up way too late last night watching the women’s all-round gymnastics finals. I was bound and determined to watch and see who won the medals. It took everything I had to actually stay awake, though. At one point, there were two blurry Nastia Liuken’s tumbling across my TV screen as my vision blurred and my eyes fought to stay open. It’s pretty amazing what those young women can do with their bodies. I remember way back in gym class, when we had to do stuff on the balance beam, or the uneven bars: scared the crap out of me. I can barely stay up straight on flat ground, let alone a balance beam, even the one that was just a couple of inches off the ground. And they do tumbling, and turns and and flips? Crazy. Speaking of crazy, my WordPress dashboard tells me that this my 600th post. I fear that most of those 600 posts are merely inane ramblings, but hopefully one or two sparked a smile or provided inspiration. 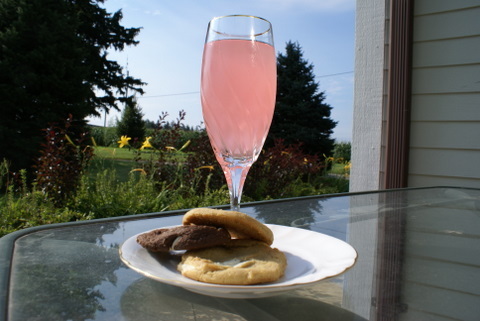 In honor of such a nice big fat round number, I decided it was time for another blog party. All you HAVE to do is show up (i.e. leave a comment by Monday, the 18th, noon Central time), and YOU might be one of the lucky ones to get a present. And for the presents? Well, I just happen to know someone who just opened an online shop selling yarn and fabric, and I’ve convinced her to donate TWO $25 gift certificates for this party. TWO! She did mention that if one of the winners lives outside the US, there will have to be some figuring out of how to actually use the gift certificate, but she’s sure she can work it out. Time to get the boys to hustle through their (late) breakfast and head to work! ** I do have to admit that my cookies are made out of frozen cookie dough, but trust me, they are VERY good.